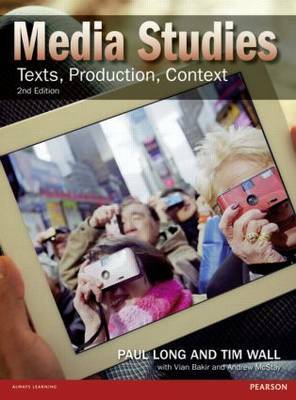 Media Studies: Texts, Production, Context, 2nd Edition is a comprehensive introduction to the various approaches in the field. From outlining what media studies is to encouraging active engagement in research and analysis, this book advocates media study as a participatory process and provides a framework and set of skills to help you develop critical thinking. Updated to reflect the changing media environment, Media Studies retains the highly praised approach and style of the first edition. Five sections - media texts and meanings; producing media; media audiences; media and social contexts; histography - examine approaches to the field including new and web media, traditional print and broadcast media, popular music, computer games, photography, and film. An international perspective allows you to view media in a global context. Examines media audiences as consumers, listeners, readerships and members of communities. Guidance on analytical tools - language, a range of theories and analytical techniques - to give you the confidence to navigate, research and make sense of the field. New case studies including Google, My Big Fat Gypsy Wedding, the life of a freelance journalist, phone hacking at News International, and collaborative journalism. 'New Media, New Media Studies' is an additional feature, which brings into focus ways of thinking about new media forms. Media Studies: Texts, Production, Context, 2nd Edition will be essential reading for undergraduate and postgraduate students of media studies, cultural studies, communication studies, film studies, the sociology of the media, popular culture and other related subjects.